The White House Office of Public Engagement, the Office of Science and Technology Policy and the U.S. Department of Transportation announced on September 14, 2012 that new safety data resources have been made available, including valuable, real-time tools to provide details about natural disasters and improve preparedness and emergency response. The announcement challenges innovators from the private, nonprofit, and academic sectors to utilize freely available scientific data on natural hazards, to build products, services, and apps that advance public safety in creative and powerful ways. 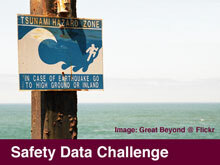 These new safety data resources are being made available on http://www.data.gov/communities/safety. In addition, the National Science Foundation is pointing to links of relevant NSF Funded Data that may be useful for this challenge and DataONE is assisting in this effort. The links below provide descriptions of relevant data in addition to URLs for further exploration. Please note, a number of these repositories are not currently part of the DataONE network and so are not retrievable through a DataONE search. The data being provided are not NSF data. They are a result of NSF funded research and are being made available by the PI and the institution. NSF cannot attest to the veracity of the data being made available. The external link below provides neccesary documentation for API’s to access the CUAHSI Hydrologic Information System metadata catalog of water time-series data from more than 90 federal, state and provincial governments, universities and NGOs transmitted using WaterML. A windows platform client is available for the CUAHSI Hydrologic Information System that accesses more than 23 million water time series data from federal, state and provincial governments, universities and NGOs. The client integrates an open-source geographic information system with time series analysis tools and exports data in standard formats. The IRIS Data Management Center's web services provide access to a variety of seismological information, including (1) Station and instrumentation metadata, (2) Time series data access and transformation, and (3) Earthquake, phase pick, and travel time data. NCAR provides access to geosciences related research data from multiple data management systems. They include (1) The Earth Observing Laboratory (EOL) Metadata Database and Cyberinfrastructure (EMDAC) system that provides access to multi-agency and International Field Project data, metadata catalog export, and browsing and visualization capabilities; and (2) the Computational Information Systems Laboratory (CISL) Research Data Archive (RDA) that provides long-term datasets to support weather and climate research over the globe.